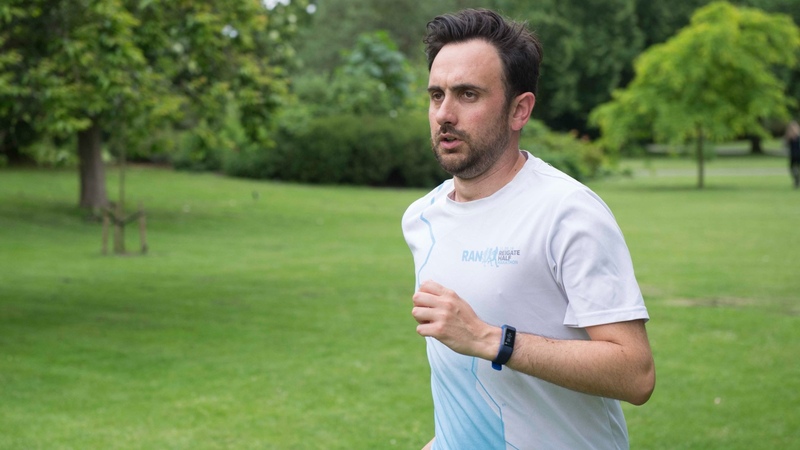 Last week I talked about my first session with Greg Whyte, Fitbit ambassador, Olympian and elite athlete trainer, as he set me on the path of running a 1:45 half marathon, using heart rate as my PT. Now it was time to hit the roads and start training – and it's been a testing couple of weeks. For brevity, we're going to wrap the first two weeks into a single post, partly because they've been such a disaster. The first week was a bit of a non-starter, as I flew to San Francisco on urgent Wareable business. For anyone who's not been, I'll just say that it's the worst place to run I've ever visited. The topography is like an Esher painting with geography defying hills in every direction. I managed two runs at threshold in the six days – nowhere near Greg's targets. However, it reinforced that the conclusions I was drawing from my data were correct. My longest run while away was a 7.36 mile run using my Fitbit Blaze (which incidentally missed a lot of data about my run across the Golden Gate Bridge, to my dismay). I averaged 161bpm for the run, although looking for the square form that Greg Whyte spoke about (e.g. discounting the first 10 mins while my heart got up to speed) it was closer to a 165bpm average. That would be my threshold HR target going forward. This is a worthy first lesson for wannabe heart rate obsessives: do a five minute warm up and start tracking afterwards when your heart rate is already elevated. You'll get much more reliable data. So week two began and with it came a good old British heatwave, which announced itself just as I landed back in London. The kind that every English person wishes for, yet deems too unpleasant to stand after the first hot afternoon. It again had a negative yet interesting effect on my runs. Sunday and Monday saw an aborted 45 minute run at threshold and 5K race pace run (I managed 2.75 miles and a thirsty 3 mile crawl respectively) thanks to searing temperatures and humidity. However, a break in the weather finally gave me the chance to go long. It was still 23 degrees centigrade (76f) at 7.30pm, but I relished the chance to get a long run under my belt. Using the data Greg gave me on my threshold square wave, my goal was to maintain heart rate around 165, although on the hills in the first three miles I couldn't stop it from creeping up to 170. It was a very strange experience, holding that heart rate on the flats. My head was telling my body to let loose and go for the PB, but the goal for the session was simple: run for 45 minutes at LT (lactate threshold or in layman's, marathon race pace) defined by Greg as just able to hold a conversation. At points, during the run, I was bored. I felt totally at ease, able to run all day. In the end I logged a 57:58 10K time. Not too shabby given that I didn't get my heart rate out of third gear, and finally, a full goal ticked off. So what did I learn from the run? Well, anecdotally, I realised that training can be easier with heart rate. I went out with a goal to run long and easy and I achieved that. Not every run has to be a battle to the limits, and in this brave new world that's fine. Last week, Greg also explained the concept of benchmarking performance, so in terms of an LT paced run, this route would now be a benchmark of my improvement. Read last week's post to see more about MISO cycles, but in week six I'll be running at 165bpm again to see if I'm improving. After a couple of day's rest it was time to hit the road again. Next on the training list was another 45 minute run, this time building in 20 minutes of AT2 (very hard intensity running). I set out on this run at a steady 165bpm again – in other words, that nice easy marathon pace, leaving plenty in the tank to get 20 minutes of hard running done at the end. Big mistake. The temperature soared as I ran, with the sun beating down and the mercury topping a balmy 27 degrees (78f). My energy was sapped and after just 10 minutes of my AT2 running pace I had to cut the run short. My heart rate hit 185bpm as I upped the pace, with the heat taking its toll. As I ran into a dusty, hot park and my body temperature rocketed, I had to take a break in the shade. A headache set in, and I could feel my energy leaving my body. The damage was done. Even when I restarted at a slow jog my heart rate raced back into the 180s as dehydration set in, I could feel it. And it was evident in the numbers. I canned the run at 35 minutes. Ten minutes short of completion, and less than half the amount of AT2 high intensity prescribed in Greg's plan. So it's not been a great start: this amount of running is tough, especially in the summer months. Greg's not going to be impressed. But I've learned some lessons. Aside from better scheduling of runs in summer, I'm getting a feel for my heart rate. Focusing on it this last two weeks is getting me in tune with my ticker. There's no doubt that I need to up my game next week, and hit those interval sessions I didn't manage to get under my belt in week two. But I'm getting a feel for my heart. 165bpm for a marathon and 180bpm for a 10K seems about right. It's all taking a bit of figuring out, but we're getting there. Next week I'll be putting intervals at the top of my priority list and talking about accuracy of HR sensors.